Parks and Recreation is dedicated to inspiring individuals to imagine and pursue greatness by building community and enriching life through parks, programs and play. Taking in our community's changing needs and demographics, the Your Parks, Our Future Master Plan represents the culmination of the master planning process and will provide guidance for parks, recreation, open space, and trails in Lexington for the next ten years and beyond. Our Your Parks, Our Future Master Plan identified several areas of strategic priority that will guide advancement over the next three to five years. Connect: Plan, develop and maintain spaces that align with community plans, services and points of interest. Gather: Provide safe and welcoming spaces that promote a sense of community. Balance: Offer parks, facilities and services that balance active and passive functions within developed and natural areas. Focus short-term capital improvements on renovation/replacement of existing, key facilities (playgrounds, game courts, trails, picnic shelters, restrooms, etc.). Increase the population served within a 10-minute walk of a Neighborhood Park (or larger) from the current 40% to 65% through development of existing parkland, new parks in growing areas (including developer contributions), and improved access to existing parks. Increase the population served within a five-minute drive of a Community Park (or larger) from the current 70% to 85% through development of existing parkland and new parks in growing areas. Improve and expand underutilized parks (add features) in underserved areas throughout Lexington to improve the level of park service in these areas. 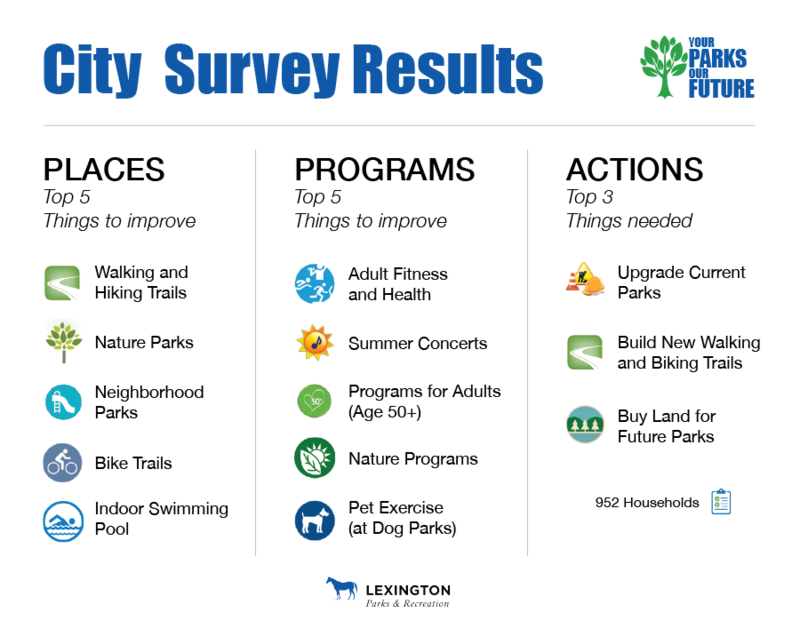 Prioritize facility and program improvements in locations with high levels of social need.6.Increase availability of multi-use trail loops within parks, providing easy access to these facilities throughout Lexington. Increase availability of sports fields for open play, youth and adult programs, and tournament hosting. Community Impact: Contribute wellness and culture through parks and programs. Safety: Coordinate with public safety and partners to provide safe and secure settings. Innovation: Provide creative programs and events that reflect trends and community desires. Increase accessibility of all facilities and programs, including ADA accessibility, information, and availability. Explore multiple uses for all venues to maximize the community’s ability to utilize the city’s park resources (e.g., use of golf courses for alternate activities such as FootGolf, birding, walking, nature programs, pickleball on tennis courts, cross country in open areas, etc.). Expand program and event offerings to meet the needs of the growing population with special consideration to new and innovative strategies for neighborhood and regional programs. Add shade in the form of trees and structures throughout Lexington for facilities such as seating areas and playgrounds. Preservation and Conservation: Conserve significant historical, natural and cultural resources within parks. Acquisition: Develop a balanced park acquisition strategy to secure open space for future generations. Land Management: Utilize best practices for natural resource management. Seek a balance for parkland development, including a 50%/50% split between land developed for recreational use and land remaining in its natural state. Restore underused parklands to natural areas (including reduction/elimination of mowing and tree canopy improvements) and maintain natural areas in future parks. Implement conservation policies and sustainable practices for development and management of park properties. Access: Engage citizens to identify needs and barriers to park experiences. Community Engagement: Raise awareness to promote, plan and improve the quality of parks and programs. Collaboration: Foster partnerships to meet the current and future needs of parks and recreation. Continuously evaluate and implement new technologies to provide contemporary services (Wi-Fi, mobile friendly platforms, social media, etc.) expected by Lexington residents. Provide additional staff and resources to continue to expand marketing efforts to increase public knowledge of parks, facilities, and programs available, utilizing diverse types of media. People: Develop an efficient organization of valued staff and volunteers. Process: Routinely evaluate facilities, services and systems. Finances: Implement operational practices to improve financial sustainability. Increase cost recovery of the division operating budget from 27% to 40% within 10 years by utilizing revenue generation and operations cost reduction tactics described in this master plan. Reduce the operating deficit of the golf courses through the implementation of recommendations of the J.J. Keegan Golf Presentation. Establish and nurture partnerships to increase the availability of both facilities and programs and to promote outreach, participation, fitness, and volunteerism. Continually monitor national and regional trends in parks and recreation facilities and programs for their applicability in Lexington. Begin implementation of the recently completed Bike and Pedestrian Plan to improve access to a variety of destinations (e.g., parks, schools, workplaces, business districts).